Doda hind boots were designed by Olympic Brazilian rider Alvaro Miranda Neto "Doda." These innovative boots use pressure points to improve natural hind leg movement over fences. The boots are not weighted, to avoid unnecessary strain. Doda boots provide ample protection to your horse with a soft leather lining and a hard outer shell. 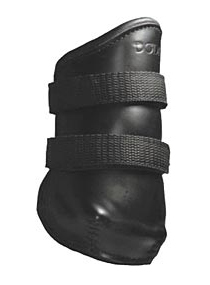 Ideal schooling boots to promote improved jumping style. Exellent protection-extra heavy, wool pile absorbs impact, helping protect against interference and other contact. Utilizes pressure points to promote correct hind end action over fences. Hard outer shell with leather lining.